Have you seen the colorful pianos around town? One of the interesting things about living in the Twin Cities are the creative ways art is incorporated into what seems to be every day life. 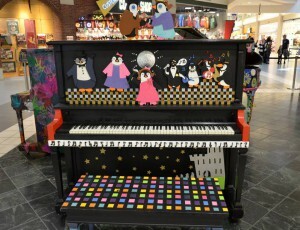 The Peanuts Statues are one example, another is the Pianos on Parade project that benefits Keys 4/4 Kids, a local nonprofit organization that sells donated pianos and uses the profits to fund charitable programs. In various locations around the Saint Paul area, beautifully decorated pianos have been placed for your pleasure. Some of them can even be played. I just love the idea of a piano as a piece of public art. It’s interesting to look at and to hear. There is a regular piano in the Minneapolis/Saint Paul airport and once in a while, you are treated to the sound of tinkling notes amongst the rumble of travel. Hearing live music is always a pleasant surprise in an unexpected place. There’s just something about the sound of a piano. To me, it’s soothing and inspiring. The pianos will only be parading for a limited time. When September arrives, the parading ends. But don’t fret, there is still plenty of time to seek out these pieces of musical art. There are even some events where the pianos will pop up. Hint: find one at the State Fair.